When the first Microsoft Surface Tablet came out to the market in 2012, I was quite unimpressed and thought Microsoft was trying to keep up with Apple and Google in the tablet market. Surface 2 and Pro 2 didn't capture my attention either. The Surface Pro 3 however caught my eye, because unlike the Pro 2 it used the new 4th gen Intel core processors (Haswell) and I knew that the time had come for Microsoft tablets to shine. When I got my laptop last year, that was a purchase I had planned 4 months in advance. At the time I knew that Intel was coming out with new processors and they would not only be more powerful, but be cooler and more efficient than the 3rd gen processors (Ivy Bridge). My HP Envy, with the Intel i7 4900MQ processor, has served me well and I still use it to run heavy processing operations like games, Mathematica, MATLAB, Multisim, EagleCAD, and AutoCAD. My main reasons for buying the Surface Pro 3 was for the note taking capability, E-textbooks, and to replace my 2012 Nexus 7. 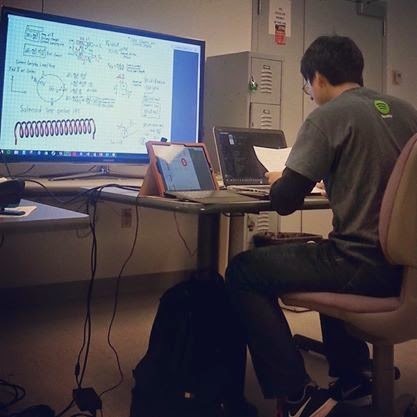 For an engineer the Surface Pro 3 cannot replace a laptop. However for any student, in any discipline, it is the best note-taking device that is available. I don't even have to carry a backpack around anymore, because all of my textbooks are on it and even my TI-89 Calculator is on it. I also like watching Netflix on it between classes and it's great for last minute assignments (When you need to get that homework paper that is due in a few minutes, just type on the keyboard, save it on a flash drive and print at a printing station.) For any engineer it is great for drawing initial sketches and schematics. Microsoft Office's One Note handles like a dream on the Surface Pro 3. Not only can you write handwritten notes and homework on it. You can insert vector graphics (Power Point shapes and figures). When writing on paper, I often find myself in the situation of writing notes in a bad format or I use valuable space for a drawing or figure. With one note you can select text and move it around to your liking and draw or insert a picture as desired. Also, If your professor writes notes and makes a mistake, you can easily erase what you wrote and just make changes and place the text in a better format. 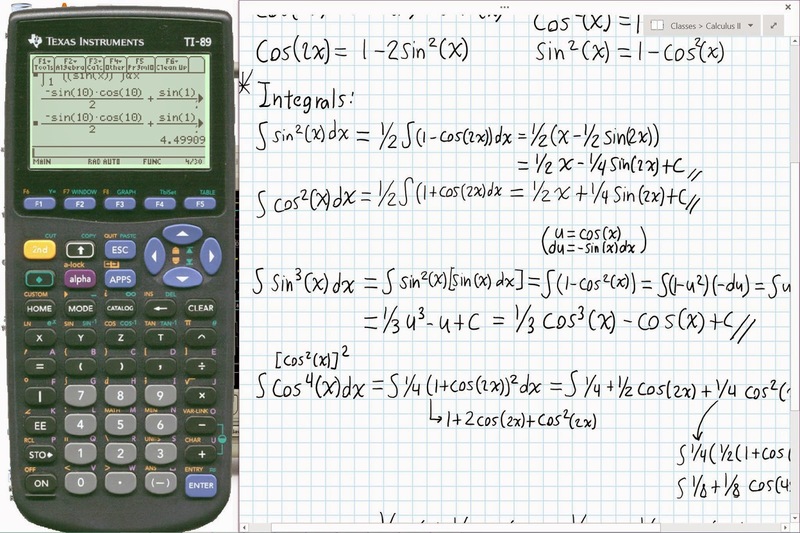 You can also run a TI-89 Emulator, so you don't even need to bring your calculator to lecture! Of course you can use it on a test, but you can use it while doing examples in class and still learn the keystrokes necessary to operate a TI-89/TI-89 Titanium calculator. 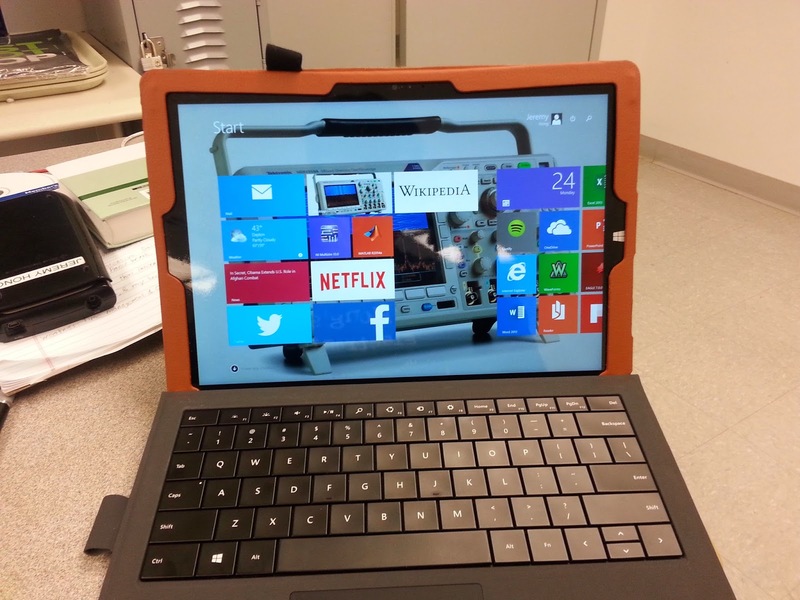 The Microsoft Surface Pro runs Full Windows 8.1 Professional. This means it can run any program that runs on Windows 8 (Don't run heavy operations, the performance of games, simulation, and CAD software are abysmal on the Surface Pro 3). On my HP notebook, I also run 8.1 and I really don't like the interface, but on my Surface it is the best interface for a touch screen and it will run any program that I can run on my HP notebook. 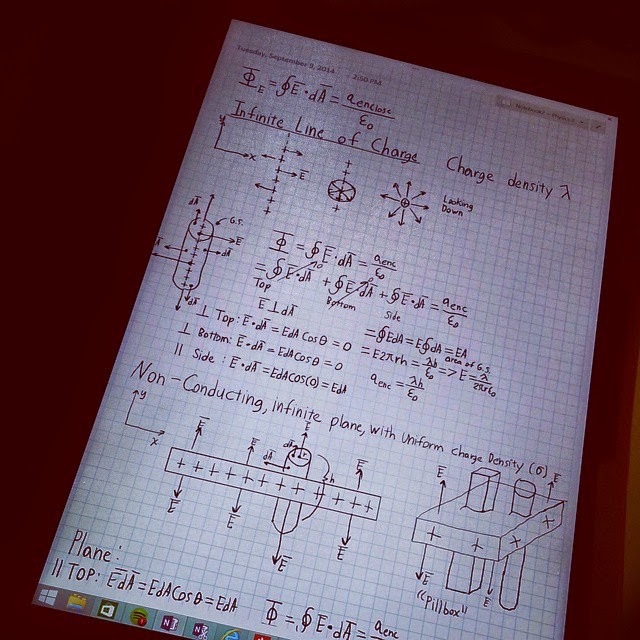 I don't use my surface for heavy operations such as CAD, Simulation Software, MATLAB, Programming, and Games, but I do use it to write ideas down or draw an initial sketch. I think comparing the Surface Pro 3 to the IPad is a completely unfair, because the IPad is not meant to be used as a computer/laptop. In the commercials Microsoft puts the Surface Pro 3 against the Macbook Air. This is a fair comparison, because both run full computer operating systems. 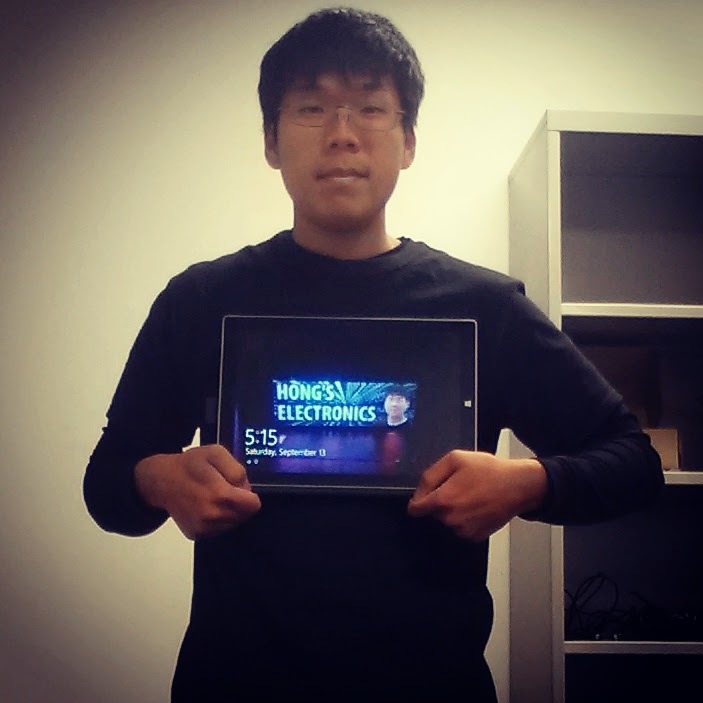 It should also not be compared to Android tablets either, because of the differences in application and purpose. Really if you want both a tablet and computer all in one, this is the best option that exists at the moment. 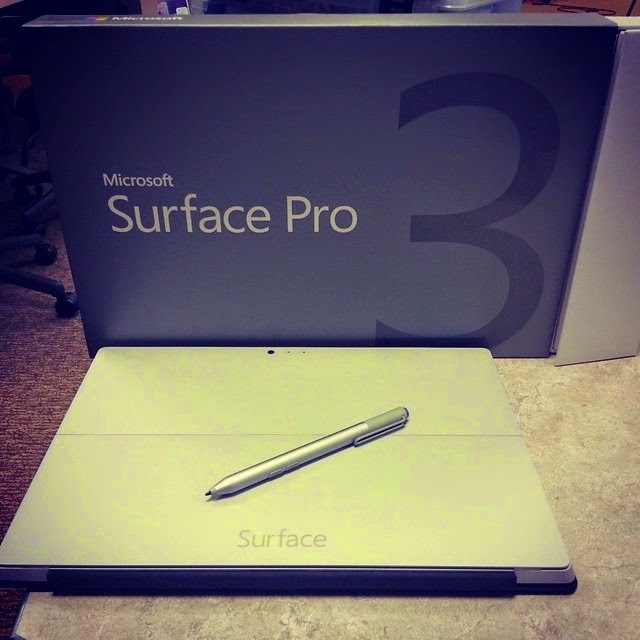 If you are looking for a device to take notes, run Microsoft Office, and use for on the go entertainment, the Surface Pro 3 is the best choice. Since black Friday is coming soon, this is a device you should definitely be on the lookout for. This is also a device to strongly consider to give as a gift. As for options if you want a tablet, go with the i3 variant. If you are student looking for a note-taking device the i5 variants are your best option (I have the i5 with 256 GB of Storage and 8 GB of RAM). If you are looking for a new laptop and tablet, the i7 variant will not disappoint you. It would appear that the i7 variant of the SP3 has one main glaring issue: The Heat Generated by its Processor. Since you didn't mention it above (most likely since you don't own that version), I'd like to talk about it a little here. Since its release, owners of the i7 variant of the SP3 have complained about the heat generated around the area where the processor sits around the back of the device. Many have stated that at times it gets incredibly hot to the touch. Obviously, in an attempt to remedy this, the fans tend to end up working incredibly hard and get very loud. This has been a well documented issue and not only a deal breaker, but a reason for the return of the product for some people. If none of the aforementioned bothers anyone reading this review, then by all means go for the i7 variant. It's clocked slower than the i5, but has a greater max clock speed (although chances are you won't be taking advantage of that). With more CPU intensive tasks, you will be likely to enjoy the extra cores and threads (and other mumbo jumbo). For more GPU intensive tasks, you will also be granted the power of the Intel 5000 HD integrated graphics, as opposed to the 4400 HD in Jeremy's model (NOTE: The 4000 series is known to be rather capable nowadays. In other words, you'll be primed to get your Team Fortress 2 and Counter-Strike on!). For the "Plain Janes" who want to do some casual web browsing and word processing, the i3 variants should suit you just fine. For most students and others who may want do take part more in multi-tasking and media consumption, the i5 variants will probably do you the most good. This configuration is geared towards those who want to do a bit more bit crunching and graphical rendering than your Average Joe. If the heat and noise don't bother you, go for it. 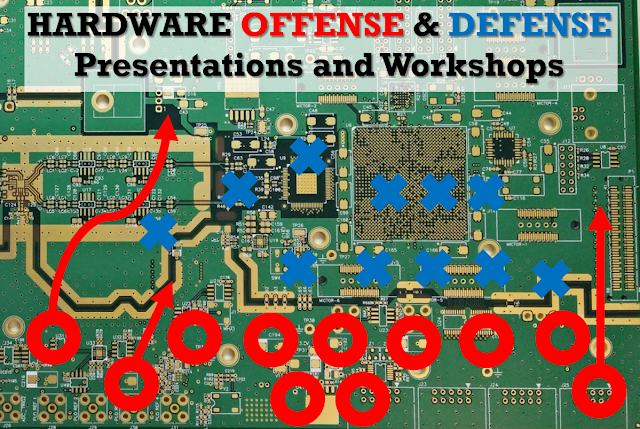 But realize that continued heavy usage may significantly affect the lifespan of your device and increase the chance of component failures (which may be an issue if you're dropping circa $2000 on the thing). For the rest of the bunch who seek to perform more computationally labor intensive tasks on their computer, a laptop may be better suited for your needs. Well that's all I had to say about the matter. Sorry for the earful, I just thought I'd share some thoughts from my perspective since I'm sorta in the market for a similar device. I'm glad it looks like you're doing well at Wright State! Hopefully I'll see you around town sometime! P.S. That's a pretty snazzy wallpaper you got right there! As a Engineering Student, I appreciate this type of outstanding post with lots of information on CAD software. It allows you to design and order directly from your browser. I hope you will get a great experience in the end. Thanks and have a good day!